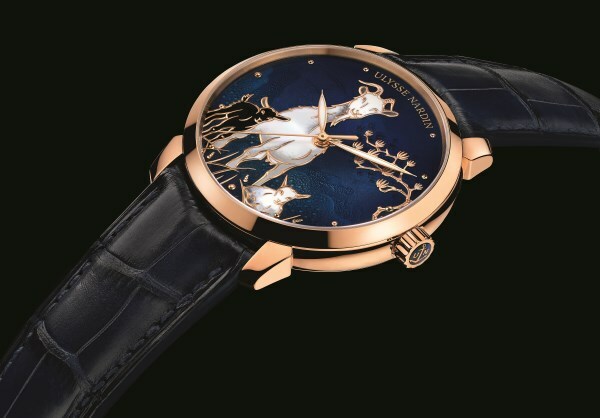 Ulysse Nardin has launched a limited-edition enamel champlevé timepiece to celebrate the Year of the Goat. As per Chinese Astrology, 2015 is the Year of the Goat and last year LifeSpice.in had reported the launch of limited edition Métiers d’Art The Legend of the Chinese Zodiac from Vacheron Constantin. Now Swiss watchmaker Ulysse Nardin has evolved its Classico Collection for 2015 with its “Year of the Goat” timepiece, also issued in a limited-edition series. This enamel champlevé creation celebrates the eighth sign of the Chinese zodiac for its individualistic and artistic character. Ulysse Nardin is among the handful of watchmakers practicing enamel champlevé. The art allows for a life-like representation of the goat on the watch’s dial. This art requires the cells to be carved with a chisel directly and then filled with enamel. The colours are generated from the various metallic oxides. The piece is fired till the enamel melts, creating a beautiful and vibrant work of art. The Classico Goat features self-winding, COSC-certified UN-815 movement, which is visible through its sapphire crystal exhibition window on the case back. The watch has a power reserve of 42 hours and is water-resistant to 50 meters. A fine example of Ulysse Nardin’s engineering excellence and mastery in enamelling, the Classico Goat is a reliable and beautiful timepiece. It’s definitely a collector’s item, especially for those born under the Chinese zodiac sign of the Goat. Tagged LifeSpice, Limited Edtion, Luxe, Luxurious lifestyles, Luxury watches, Sartorial Notes. Bookmark the permalink.